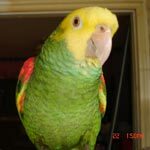 Parrot Forum • View topic - Do your parrots ever crash into you? Do your parrots ever crash into you? Discuss indoor freeflight and managing freeflighted birds around the house. How to live with a flighted parrot. Re: Do your parrots ever crash into you? Myrtle's crashes are not accidents. She deliberately dives and crashes on us just to make us yell. She just loves to crash into Aunt Betty. Aunt Betty is a screamer and she is just another way to make noise. They love noise. If they make the noise or create it it is all good to them.